I’ve written about spaghetti sauce several times before, but it belongs in the list because it’s a no fail sauce. It’s tasty, versatile, and with just small tweaks in spices, can be anything you need. I used to make the sauce from scratch, then moved to canned tomatoes. Then I moved on to jarred sauces which I then added to, and recently have gone back to canned tomatoes. The premise for all of them is basically the same. Fry up a pound or two of hamburger in a skillet and drain the fat. Add two cans of chopped tomatoes with the juice, and a small can of tomato paste, along with two cups of water. Add some oregano, basil, garlic, and onion, and simmer for a few hours until all the water has evaporated off. You’re left with a thick, meaty, flavorful red sauce that stretches to anything you need. Vary the pasta and you can make spaghetti, beef a roni, stuffed shells, or ravioli. You can use it to fill larger shaped pasta, or in baked pastas like lasagna. It can even be spread on dough and used as a pizza sauce! Switch up the spice palate to the spicier side and you can turn this same sauce into chili con carne. Adding cooked macaroni turns that into chili mac. Just don’t try to turn an already existing Italian flavored sauce into a spicier sauce for chili. I’ve never been able to make that work. This is actually a variation of the above, but kind of sort of not. 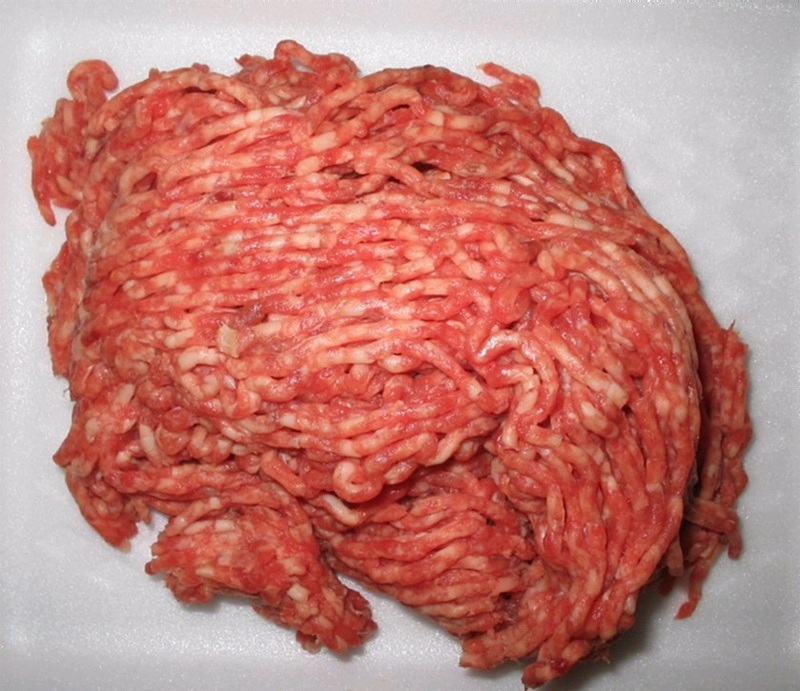 Years ago, one of the processed foods companies came up with several packaged mixes to add to your own ground beef. It started as spaghetti and moved on to others. They didn’t taste very good since the freeze-dried portions of the mixes didn’t reconstitute very well, and the choices of spices weren’t the best and had a chemical taste to them. One that seemed to work well was Cheeseburger Macaroni. Basically, it was mac and cheese with fried hamburger in it. It was moderately okay, for hungry pre-teens, it was good. Once my palate evolved and I knew what really tasted good, almost all pre-fab dinners went away. Except, once in a while, when I’m really wanting some comfort food, boxed mac and cheese fits the bill. I nearly always dress it up, though. Added veggies, nuts, seeds, meats, until it’s more a casserole instead of a box mix. The basic is fry up your hamburger. I season it heavily with salt, pepper, onion powder, garlic powder, and sometimes chili powder. I fry it all up until it’s one large hamburger, then I break it into large pieces. I use a slotted spoon and pull out the meat and save the grease and juices for the dogs’ dinner. As the meat is cooling off, I make the mac and cheese. Once it’s done and mixed, I put the meat into the mac and cheese and stir thoroughly. It’s ready to eat. Sometimes, though, I add extra cheeses, or cooked veggies, or nut and seeds and toss it into the oven to bake for half an hour or so until the top is bubbly and brown. Sometimes, I’ll crush cheese crackers for a topping. I’ve been known to eat three large bowls of this stuff. Meatballs are the easiest things to make, once you know how. For years, I struggled with shaping the meatballs and frying them in a pan where they’d lose their shape, or not cook completely through. Then, out of the blue, I thought, why not bake them? Works perfectly! Make your favorite meatball recipe, shape them, put them on a baking sheet WITH a side to catch the drippings, bake at 350 for 20-30 minutes, place in a sauce or other recipe, and eat. Porcupine meatballs, though, have to be made on the stove top in a large skillet so the sauce can catch all the meat drippings and flavors. Make your favorite meatball recipe, whatever it is, and add 1/4 cup uncooked rice to the mix. In a large skillet over medium-high heat brown the meatballs on all sides. Turn the heat down to medium-low. Add one can of tomato paste, a tablespoon of brown sugar, a table spoon of dijon mustard, and two cups of water. Add any herbs and spices to complement whatever meat you’re using and stir to mix thoroughly. Cook for 30-45 minutes stirring every few minutes to keep anything from scorching. Add water if the sauce gets too thick, but none during the last ten minutes. As the rice cooks, it will start poking out of the meatballs giving the impression of a porcupine. Serve with rice with the sauce spooned over it. 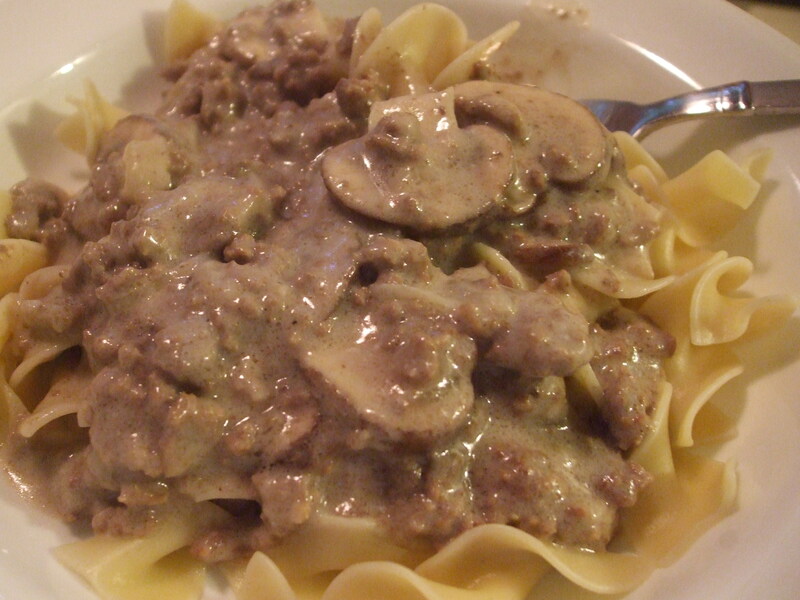 Beef Stroganoff is typically made with beef chunks of medium quality, much like stew meat. It’s cooked for a longer time allowing the meat to become tender and the flavors to blend. However, if you don’t time or a roast to cut up, hamburger makes a fine substitution. Brown the hamburger over medium heat, remove to a bowl, and drain juices leaving two tablespoons. Melt two tablespoons of butter in the pan with the meat juices and brown 2 cups of slices mushrooms and on medium onion chopped. Add two cloves of minced garlic. Add 1 1/2 cups of beef broth, 1 tablespoon of tomato paste, and salt and pepper to taste. Add meat back to the pan and simmer for 30 minutes for flavors to blend. Sprinkle 3 tablespoons of flour lightly over the mixture and stir to combine and prevent lumps. When the sauce has thickened, remove from heat. Add 1 cup of sour cream or plain yogurt stirring to combine well and keep from curdling. Serve immediately over noodles or rice or mashed potatoes. It’s good stuff. You knew if I was talking about hamburger meatloaf had to be in the discussion, right? I like meatloaf although I didn’t used to. When my mom made it when we were kids, it always had way too many onion for me. And for some reason, my mom and dad liked the bitterest onions they could find. At least, it seemed like it to me. But my tastes mellowed and I got to enjoy it. Then I started making my own and experimenting. I followed my mom’s recipe, then the recipe on the onion soup mix box, then started branching out. Nowadays, I follow whatever is in the pantry. Meatloaf is simply flavored hamburger with a binder that’s been baked until it’s done. I once had something at a restaurant that was billed as “Grilled Meatloaf”. It sounded intriguing so I ordered it. Big mistake. It was a slice of cooked meatloaf that was put on the grill to get a grill flavor to it. Not a bad idea, but they added their “personal spice rub” to the outside of the meatloaf so its flavors battled each other to point of inedibility. I ate everything else, but couldn’t eat the meatloaf. They still charge me for it. 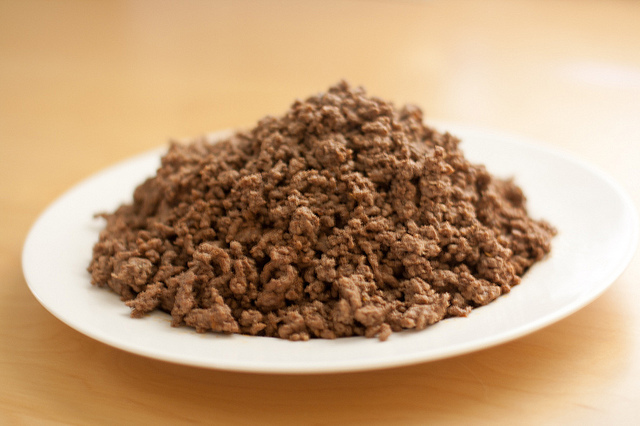 These days, I mix the ground beef with other ground meats if I have them. I add my own spice blend which includes garlic and onion powder as well as a little cumin and nutmeg. Sometimes I add finely chopped pecans or walnuts, or sunflower seeds, but not a lot. Sometimes, I’ll add a small can of chopped tomatoes. Sometimes, I’ll grate a potato and/or a carrot and add that. Sometimes I’ll add stuffing mix as a breading filler. Once it’s done, I’ll shape it into a loaf on a sheet pan with a raised edge and cover the load with ketchup. I bake it at 375 for 30-45 minutes until it’s done. My meatloaf is seldom the same way twice in a row. Matter of fact, very little of what I cook is ever the same way twice in a row. But it’s usually pretty good. Hamburger Thing 6 – Hamburgers! Just Kidding, Tacos! Really, I grew up with tacos made from hamburger. It was until I was on my own that I started using roasts and steaks and other kinds of meats. So, for me, tacos as a comfort food can only be made from hamburger and never with any kind of spice on it. It’s basically a hamburger in a corn tortilla. My mom and dad both would fry the tortilla in oil briefly on each side so they were hot and soft. We’d sit as a family at the table with a bowl of hamburger, a bowl of cheese, a bowl of tomatoes, and a bowl of lettuce. There was a plate with stack of fried tortillas in between layers of paper napkins to sop up the excess oil. Then, one by one, we’d each build our taco to our own specification and chow down. I still prefer it that way. But, I’ve eaten tacos with every imaginable filling, even beef tongue, which was pretty tasty. Tacos are just meat and various fillings held together by a tortilla or flat bread. But the ones made of hamburger with cheese, tomato, lettuce, and occasionally some salsa on a floppy warm corn tortilla sends me all the way back to age six. I was building a taco and spooned up some tomatoes. Immediately, all three adults admonished me (two parents, one older sister) to not take so much. 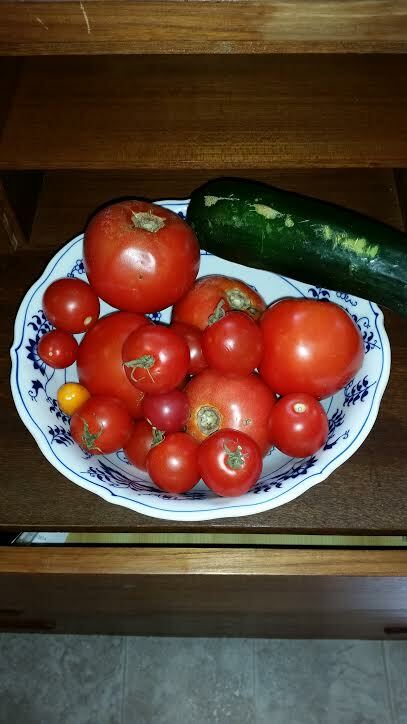 I tipped about half the tomatoes back to the bowl with regret. I liked tomatoes. Why shouldn’t I have that much? Were they bad for me? But if they were bad for me, why were they on the table to be eaten? Mom told me years later that she could read every thought going through my head and had trouble no laughing out loud. I finally decided that to make a “proper taco” you had to balance the tomatoes on the lettuce so they didn’t fall off and so you could only use a few. I don’t do that anymore. Julia Child always said “Be Fearless! Have the courage of your convictions.” Whether she was tossing an omelet for the first time on television or talking with a guest chef decades later on another show, the message remained the same. I tend to be a safe cook. I want my family fed, and fed well. So I follow the recipe as written at least once. I watch other cooks closely to follow their technique and make certain I can replicate it. Occasionally, I will branch out on my own to create something unique and tasty, but it’s nearly always a take off from another recipe that I just messed around with. But I’ve known some cooks who were utterly fearless in the kitchen. Like Julia, they would look at a pile of ingredients and say “What if we did this?” and strike out. I’ve told you about my little brother and his “damn the torpedoes” style of cooking. He happily ate the results and lived to tell the tale. And turned into quite a good cook along the way. Another is Partner/Spouse. Like me, he’ll watch another chef creating something while turning over in his mind how he would do it. He’ll latch on to a single ingredient and mull it around into something uniquely his. Like this weekend. We had our usual busy weekend filled with errands and road trips. One of the Sunday morning errands was doing the little bit of grocery shopping that needed to be done. Grocery shopping for us is a never ending task, not only because we actually use the groceries we buy, but because inevitably we forget something important. We do the list thing, but sometimes things don’t actually get on the list that we need. We honestly try to shop once every two weeks (except for fresh vegetables when they’re in season like now). And we adjust menus and dishes for what we have on hand so we can get by without the important item we forgot until the weekend. Then we’ll go shopping and actually pick up the item we forgot, while forgetting another item just as important in the process. Like I said, it never ends. We’ve discovered that the best time to do the bulk shopping at our favorite store is first thing Sunday morning. Sometimes we preface it with a quick stop at the diner so we don’t go into the grocery store hungry. Or else we make certain to eat something before we leave the house. Either way, it helps to cut down on the impulse buys. We had originally discussed having fried chicken and tater tots for dinner. Simple comfort foods perfect for the end of the weekend. Once that bottle was in the cart, I knew those plans were out the window. But since I wasn’t cooking, I was happy to let whatever was going to happen take its course. We had steamed rice. Love steamed rice. There were fried mushrooms for me! And in the large skillet, there were large chunks of deep fried chicken breast with snow peas and leeks swimming in the jarred orange sauce from Panda Express. But Partner/Spouse couldn’t leave it there. He added some extra stuff to the sauce. He put in some garlic and just a few crushed red pepper flakes. It had a tiny kick to it and made it taste so much better than it would have otherwise. I loaded my plate up and came nowhere near finishing it. But it was good. And it’s not what I would have done. Since I didn’t conceive of it, I didn’t make it, and I didn’t serve it, it in no way would have matched what I would have made. I would have read the directions on the bottle. I would have searched the internet. I would have looked at the cookbooks I have massing up again. Only after I was completely familiar with the standard recipe would I have started branching out and adjusting flavors to my taste or to our tastes. Some people start at that step. And it was GOOD! Post #419 Is Customer Service Dead in America? Despite the title, this post really is going to be about food. Just not at the start. First, a little bit of sad news. A couple of months ago, we lost our Dusty-dog. 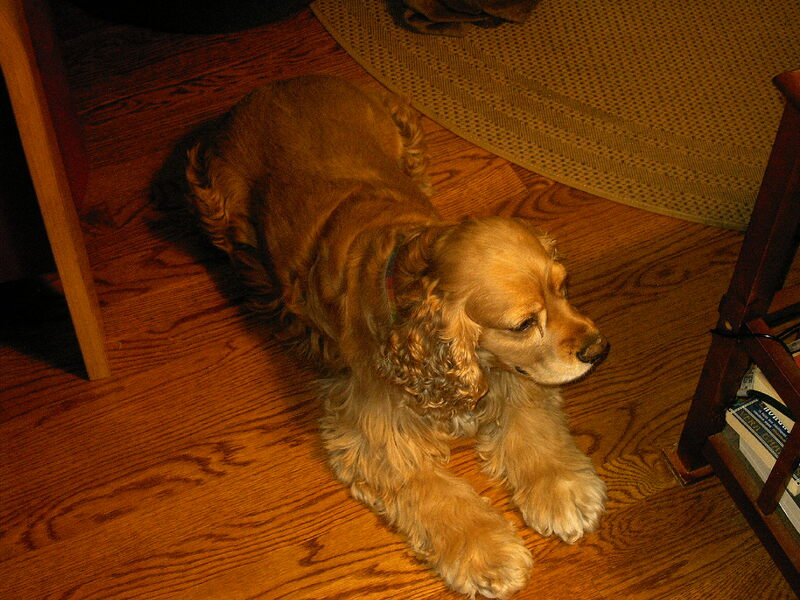 We rescued him when he was an older dog and we got to treasure him and spoil him for six years. He developed some fast growing tumors and the vet said the best thing was to make him comfortable for as long as possible; he wasn’t in any pain. During the final few days, as he grew weaker, he became a little incontinent and the carpet near the front door became stained. I worked to keep the area as clean as possible, but I also didn’t want to upset Dusty too much. After his final vet visit, I scrubbed and washed and got most of the stains up. We had three dogs in this house for a year. It’s a damp area sitting between the Atlantic Ocean and the Chesapeake Bay. During summer and winter the house is closed tight. During spring and fall, it’s open, but there are humid days. Scents tend to grab onto things and stick around. Particularly carpets. We spread baking soda, and other deodorizers, and once a month I’d get several cans of Resolve and a scrub brush and get as much stuff off the carpets as I could. But after Dusty left us, we decided it was time to get the carpets professionally done. Last weekend, Partner/Spouse got online to Sears Home Services and scheduled deep carpet cleaning and dog deodorizing for the three downstairs rooms and the stairway. Those were the only rooms the dogs went to because we kept the upstairs blocked off. He set up the schedule for Thursday morning. We had a guest on Sunday and were out and about a lot, but late in the afternoon, there was a voicemail on my phone. I listened but couldn’t make out all the words except I could tell it was Sears Home Services. Later, I received a confirmation email with a contact number. On Monday morning, I called them back and explained I couldn’t understand their message, and then confirmed the time and the address and contact info. The woman told me I’d be receiving a call the night before the appointment, and another call when they were 45 minutes away. She said to expect them between 8am and 12pm. Standard stuff, no worries, no problems. Thursday morning, I got up at the regular time and around 7am, after the dogs were fed, I spent 30 minutes moving furniture and getting stuff out of the way. I forgot my own breakfast, but carpet cleaning is fairly quick so I anticipated being able to fix something quick and easy fairly soon. I didn’t want to make anything until they were gone because it would be awkward if they came in during the middle of fixing something, etc. By 12:30pm, I was getting angry. No call, no show, no food, no clean carpets. I called and the young lady looked up the appointment and said, “I’m sorry sir, but your appointment was cancelled. You’re out of our service area. Someone should have called you.” Anyone who knows me will be able to figure the next sequence of events. I was polite to the girl since I knew it wasn’t her fault but she made the notes in my file, etc. I took to social media, and some of you may have seen it. I hit FB, Yelp, went to the franchise’s web site, and the corporate web site. Then I called Partner/Spouse to tell him what happened. He happened to be on his way home early, also hungry and said he was taking me out for a late lunch/early dinner when he got home. So I fumed and stewed and slammed furniture around and hit the carpets with Resolve and a brush. Then took a shower and played on the computer for fun. We ended up at one of my personal favorites, The High Spot. It’s on High Street here in our little town. 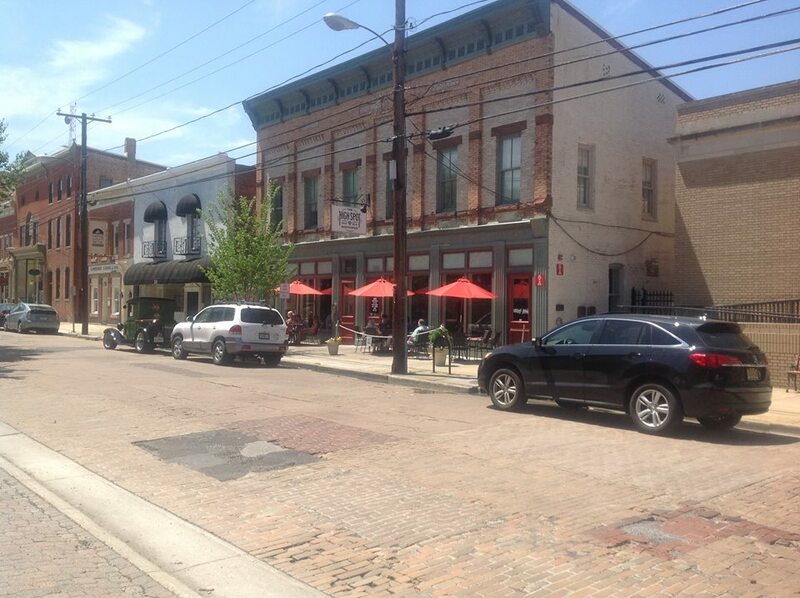 It has outdoor seating, on street parking, and is just a fun little spot to eat. We sat at the first umbrella to the right. It’s an upscale restaurant, a little pricey for just simple casual dining, but it’s so good! We started with a glass of house chardonnay from a local vineyard I hadn’t been to yet and it was so smooth and so mellow! I very tasty wine. Drinking wine in the middle of the afternoon on a Thursday with perfect weather seemed very Parisian and slightly decadent. We then shared a grilled Caesar salad. It was an entire half head of Romaine lettuce that had been place on the grill for a minute or two so part of it was charred. Then the homemade salad dressing was drizzled on it and it was sprinkled with bacon bits, parmesan cheese, and homemade croutons. (If you’ve never made your own croutons, do so one time. You’ll love it.) Grilled lettuce just tastes burned, but the charred flavor combined with everything else was unique. Partner/Spouse had a hamburger grilled in duck fat with a fried duck egg on top. It was way to large to just pick up and eat so he plowed into it with a knife and fork and found it delicious. I ordered the fish and chips and it was perfect! The fries were excellent, but the fish was deep fried and if it had stayed in the fryer another five seconds, it would have been ruined. The chef has a very deft touch and seems to know exactly when something is done. A whole bowl of tomatoes. (I already had the zucchini.) Not sure what I’m going to make with it but grilled tomatoes for dinner this weekend sounds good. But even better, I found a new winery. New for me, not them. 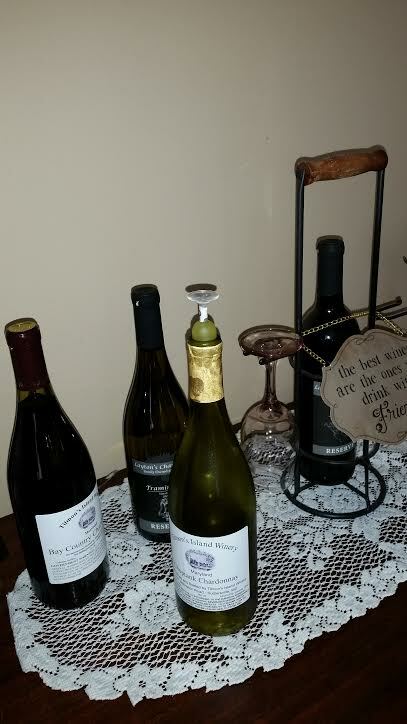 It’s called Tilmon’s Island Winery. The guy manning the booth was about our age, big fluffy beard, big straw hat, and a personality as large as the river we were next to. He let us taste, for free, anything we wanted. I asked for a dry white and he gave me the a taste from the bottle you see at the front. It’s called Choptank Chardonnay. It’s wonderful. Then he mentioned the chambourcin grape and we had to have a taste of that. It’s a red wine and in most places tends to be a little heavy, but this was light and pleasant. It’s called Bay Country Chambourcin. I went to their web site and found that they are a “boutique” winery, making only small quantities of high quality wines. We bought four bottles and got them for around $8 each, even though they sell for quite a bit more than that through their web site and store. So two are in hiding for our upcoming nuptials, and two are out for consumption. I’ve already starting consumpting the chardonnay, as you can see. Before we left, he recommended his rhubarb wine. I don’t normally like fruit wines (although out here on the Eastern Shore they seem to be a way of life and most I’ve tried are very good) this was exceptional. As a kid, I used to eat rhubarb right out of the ground because I loved the sour taste. I like rhubarb pie, even the ones with strawberries. This wine tasted like wonderful wine, with the light taste of rhubarb, and the hint of summer in the background. So good! So we went back home, I finished the carpets, dealt with a couple of emails from Sears. And then realized that overall, despite it’s beginning, it was a pretty good day. Sears may have sucky sucky sucky customer service, the small town where I live still has people who like and care about other people and are willing to treat them well. My mom passed away from cancer in June 0f ’91. It wasn’t a very long battle, but at the beginning it was fiercely fought. She and dad investigated a lot of adjunct treatments and one of those was the juice diet. They purchased a top of the line juicer and proceeded to juice everything in site. The theory was sound enough. You juiced the whole vegetable or fruit, or piece of wood, and the juice came out spout having gone through some internal filters. Those filters had to be cleaned after every use or they’d clog. A simple tap to dislodge and a quick rinse, and the filter was ready for the next go round. This juicer was a monster, weighed in at about twenty-five pounds. Large and heavy, it was designed to stay on the counter or table and in constant use. The leftover pulp could be used for cooking, or if you bypassed the filters, it could be left in the juice to be drunk. It was a masticating juicer and the idea was that it would grind everything up and separate the solids from the liquid. Mom used it once, then let it sit idle. It was cumbersome, and she didn’t like the juice that came out of it. It was too thick. As she said, “The idea of celery juice is more appealing than the actuality of celery juice.” Then they offered it to me and I gladly accepted and shipped it home. Well, you know me, I read everything I could get my hands on about juicing and about this particular juicer. I learned all its ins and outs; took it apart and put it back together with no extra parts left over, surprise; and I learned dozens of recipes for combining fruits and vegetables into tasty concoctions that would save wear and tear on our teeth and cause less stress on our stomach not having to breakdown cell walls to get nutrients. At least, that was the claim. Spurious, to say the least. But I experimented and played and came up with some nice juices. Sometimes I’d save the pulp and make muffins or breads, or paper, if I was juicing wood. This monster could actually get juice out of wood. One evening, I stumbled across something when trying to make tomato juice so my ex could have a Bloody Mary. She didn’t like just the juice, saying it had no body, so I put the filter bypass in and let all the seeds, pulp, and skin go through the juicer. A thick watery mass came out and the flavor of the tomato shined. I add the requisite ingredients (vodka) and she like it a lot. But I was looking at the leftover and wondering what it would be like on pasta. So, the next evening, I processed a few tomatoes, boiled up some pasta, added some dried herbs, heated the sauce, tossed it with the pasta, sprinkled on cheese and served it up. It was spectacular! It was the freshest, brightest pasta sauce we’d ever had. The flavors of the tomatoes and herbs just bounced around the tongue. Nothing was masked by anything else. Each flavor stood on its own, distinct and identifiable, not in contrast but a perfect blending. At that time, I didn’t know the tricks to helps sauce stick to pasta (I was still rinsing the pasta then) so it was really like eating a fresh tomato soup with pasta in it, but it was still very good. We ate this for several weeks, but gradually tapered off as the novelty of the juicer waned, and the inconvenience of using it grew. Eventually, I gave it away to someone who was far more into the juicing lifestyle than we were. I went back to making my marinara sauce as usual, and over time forgot the brightest spaghetti sauce I’d ever made. Last week, I was scrolling through my timeline on Facebook. That’s a real chore that requires a certain dedication and a fairly large block of time. I get most of my news from the internet now, so all of my news services are on my feed. All my writer’s groups are on my feed. All my friends are on my feed. Most of my cooking input is on my feed. If I don’t check my FB page at least every couple of hours, I may as well hang it up. Some days, I only have time to check my alerts. This day, I was scrolling fairly quickly through my timeline. I tend to ignore every single video because I don’t always have time for a two minute investment. One video made me stop. I love the life hacks and cooking hacks that come my way. Most are common sense; many show something I’ve been doing my whole life. This one showed a way to prepare tomatoes that rocked me back in my chair, and it’s a swivel chair so it rocked me way back. This guy made a full Italian meal of pasta and tomato sauce in under 15 minutes. I watched the video and ran out to get what I needed. I already had 98% of it. 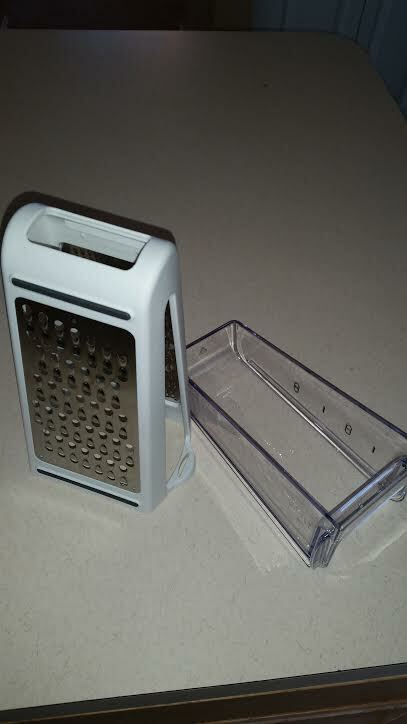 I needed a box grater. That was all. Growing up, the only grater we had in the house was a box grater with four sides that had a shredder, a slicer, and two different mincers. It was old, dented, and always looked vaguely unsavory, but it worked perfectly. Now, of course, we have every mincer, slicer, grater, etc. in both manual and electronic. Except a box grater. So, I got it and the tray that came with it. Then I stopped at the my favorite veggie stand cuz I did not have any large fresh tomatoes, oddly enough. Here’s how this works. Take a ripe tomato and cut it in half cross ways, not top to bottom. 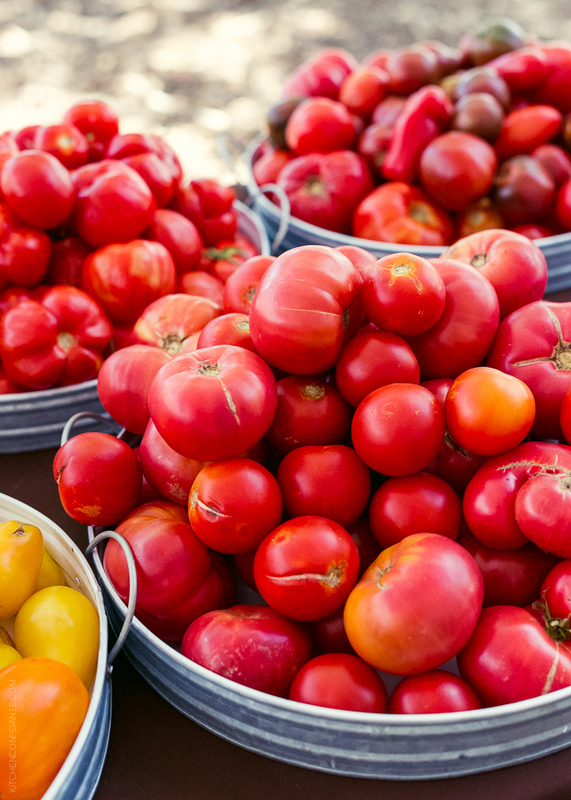 Place a box grater in a large bowl and gently grate the flesh of the tomato into the bowl. Be careful when you reach the skin, but when you do this gently, you’ll be left with only the skin in your hand and all the flesh and juice and seeds in the bowl. Plan on one large ripe tomato per serving of pasta. When the tomatoes are grated, push them through a fine mesh strainer into another bowl to remove the seeds. I didn’t do this because we like the seeds. You may not want to do this either. Using a micro-plane, and mince one or two cloves of garlic into the tomato sauce. Add a pinch of salt, and a tablespoon of olive oil for richness. Add fresh or dried herbs of a kind you like. I used fresh basil from my herb garden. (New plants, no bugs.) Then just add freshly boiled pasta directly to the sauce. The heat from the pasta will “cook” the tomato sauce, of sorts, so it will be ready to eat immediately. I topped our plates with parmesan cheese, more herbs, and served with toasted garlic bread. It was yum, and mirrored the sauce from the juicer exactly. And was way easier. The entire meal was ready in under twenty minutes. We had a fun and busy weekend. The weather out here has turned cool, with the humidity up and down, mostly down. We opened up the house to get all the fresh breezes inside and took the opportunity to CLEAN top to bottom. The fresh air blew all the dust we raised right out the windows. We chased dusty bunnies down the hallway, corralled them in the dining room, tossed them out into the wind and watched them float away. Of course, now two days later, I’m seeing new dust bunnies, but that’s a different batch and a different matter. With all the errands we did on Friday, we wanted a simple meal but a really good one. So I made a stir fry out of every fresh vegetable I had in the fridge plus chicken. And it was really good! It had cabbage, snow peas, onion, garlic, carrots all in a teriyaki glaze. I’m probably forgetting some veggies. And we had it over the pre-made fried noodles. It was good stuff. Saturday was another busy day finishing the cleaning and straightening and getting ready for a one day visitor. Since we didn’t know when she’d arrive exactly, and the main purpose of the visit was to go to the veggie stand I’ve mentioned in this blog numerous times, I planned a Sunday brunch. So we had to go get the things we needed that we didn’t already have. So, since it was Saturday, I had to get a bottle of wine and we had to have our Steak-n-Salad. I’ve blogged about that before so I won’t bore you with the details except to say, YUM! One of the things that kept me busy on Saturday was baking for the brunch/visit. We haven’t seen this woman for close to a year. Her busy life, our busy lives. We just hadn’t made the connection since we first moved back to the area. I was anxious to make things that were good and impressive. Her daughter is a very finicky eater, but loved my homemade sandwich rolls. So I made a batch of those, splitting them in half so we had some and she had some to take home. Then I made a pan of brownies, but I dotted it with hot fudge sauce that had coconut in it. So for Sunday Brunch, I was going to make a fruit and cheese and veggie platter. I was also going to make homemade English Muffin Bread since I’d blogged about it and she wanted to try it. The English Muffin Bread is simple and fast so I was planning to make it Sunday morning. We’d bought a few things for the brunch on Saturday, but I wanted to take her to the veggie stand immediately and pick up the rest of the things there so it would be fresh as possible. But I also decided to make Egg Muffins. And I wanted sausage from our butcher to put in it. That’s when we decided to have the Steak-n-Salad on Saturday since I was at the butcher anyway. So Sunday, six o’clock rolls around. The dogs let us sleep in, but the were ready to go out. I started the sausage cooking since I needed that to be completely cooled for my recipe. While I was cooking the sausage and feeding the dogs, I put the bread together in my giant violet-colored bread bowl. It’s a giant ceramic bowl we bought at an antique store in Tucson for $7. No idea how old it is, but it’s worth its weight (very heavy bowl) in gold. Mostly it stays hidden because it really is an awkward bowl to use, but I needed it for this recipe. In the meantime, Partner/Spouse was fixing breakfast and straightening things up a bit. I double checked that everything was ready as it could be, bread was rising, dogs were napping, music was on. Time to sit at the computer and get some work done. There’s typically not much on television on the weekends that we want to watch. I miss the old Saturday morning cartoons and the roadrunner’s “beep beep!” so we usually have the television tuned to on of the music stations, the sound system on low, and the TV itself off. The music permeates the house and sends a calming relaxed feeling throughout. By 9am, we were both wondering what the schedule was going to be. Then a beep from a text, a happy “On my way!” and we knew we had at least 90 minutes before arrival. She actually lives close by mainland standards and drives like a bat outta hell, so we weren’t surprised to see her pull up just a little over an hour later. Lots of hugs, dogs barking, “Hi”s and “How are you?”s and general pandemonium before sitting in the living room on real furniture she hadn’t seen yet. After our very successful foray to the veggie stand, it was time for the brunch. I turned the oven on to 375, a gentle heat to bake eggs. I sprayed a dozen cupcake tins with cooking spray. I cut four half-inch slices of English Muffin Bread, then cut those into enough chunks to put four in each cup cake tin. I toasted them for about 10 minutes in the oven. While that was going on, I started cutting veggies, fruit, and cheese. I put the platter out with some other cheese spreads, and toasted another four slices of bread which I then cut into quarters and put in a bowl instead of crackers. Once the bread in the oven was ready, I pulled them out and put four chunks in each muffin tin. Then I divided the cooled sausage evenly in each. I put a very light sprinkle of a Greek herb mix that I had in each tin, and broke an egg into each tin. 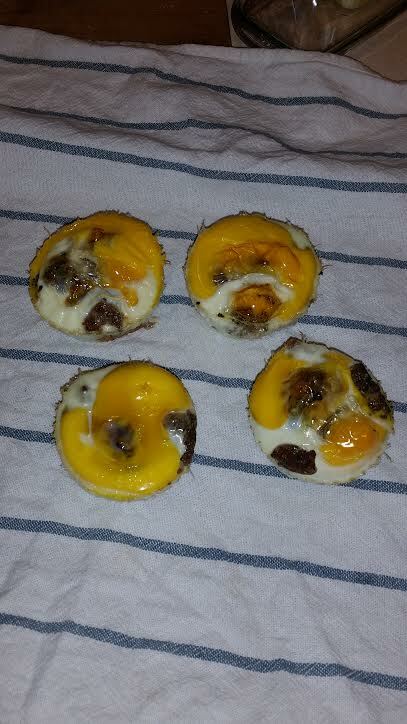 I used a fork to break the yolk and lightly spread the egg so it would flow into all the nooks and crannies. Then on half of them, I put a small amount of shredded mozzarella cheese. These went into the oven for 25 minutes. While we were eating our fruits and veggies, etc, the wonderful aroma of egg muffins filled the house. Finally they were done, and we each had two. And they were so good! We’d picked up a couple of half pies at the veggie stand (coconut and pumpkin, because believe it or not, our guest had never eaten pumpkin pie in her life!) and with the brownies and leftovers, we nibbled all afternoon long, even after the trip to the winery! Good stuff. 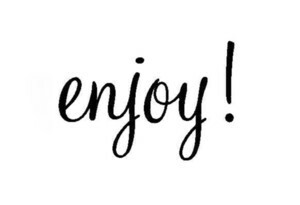 A friend of mine writes a daily blog called “I Should Be Laughing” which focuses on the daily struggles he and his husband face dealing with life as a gay couple in a very small town in South Carolina. He has a biting wit, a wonderful sense of humor, and even when we disagree, we keep each other laughing. He wrote a post today that I encourage you to read. It deals with a situation he and his husband experienced last week about something that is little known. It opened my eyes to something I certainly had never heard about. It’s something we should all be aware of and share so more people know about it.